My first blog - and a new look! Logos and branding - your own personal artwork! Are you setting up your own small business, or want to give your company a stronger identity? Successful businesses are built upon strong brands. Do you need to create one, or does yours need improving or maybe even a total overhaul? A 'brand' can start with your logo, website, leaflets and stationery, but it also means the entire customer experience you provide - including how you answer the phone or communicate by email. Do your customers love doing business with you? Your brand is your personality - it's what you stand for. So how can you take it to new heights? Starting up a new small business involves so many things to think about – and creating your logo design and brand identity is one of the key areas to get right, right at the start! I really love designing branding and logos which make my clients feel truly proud of their business - and which genuinely reflect their personalities. It really matters to me that you get what you want and that it feels right - nothing beats that feeling of seeing your very own, unique, brand-new brand on your first set of business cards - it's fantastic! Developing a brand which your clients and potential customers can recognise and relate to can be crucial to the success of your new venture, so it’s vital to create a unique identity for your business – one which screams ‘quality’, gives you a really professional look and feel, and distinguishes you from all the rest. Here’s your chance to make that great first impression! 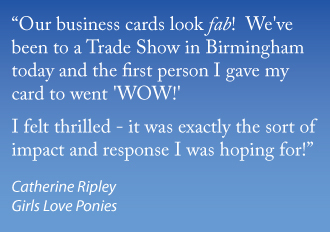 There’s nothing more satisfying or guaranteed to build your confidence when you start up your own company than handing out professionally produced, well-designed high quality business cards – it’s a great feeling to have a distinctive identity which makes you feel really proud, and this is how you really can put your business in your customer's pocket! And knowing your brand carries through to your stationery, marketing literature, website, invoices and so on will strengthen both your confidence, and the confidence of your customers, who will perceive you as a professional, established business well worth dealing with. I can help you create this identity to get your business underway with a swing, easily and quickly. I can design a logo or work with one you have already chosen to bring your concept to life by developing this into a perfect brand package to ensure the look and feel of your business is consistent, stylish and appropriate to your line of work. That sense of pride is hard to beat! Internal documents – timesheets, expenses forms, etc.